Notes to recipe: The cheese filled hot peppers are an italian recipe for a finger food and appetizer. For the cheese you can use soft goat cheese or also a young pecorino, but you can choose whatever cheese you like. The stronger is the cheese the better will be the flavor. Filled red hot peppers is a recipe for people liking strong flavors. We suggest they to can and let them rest for at least a week before eating. In our video recipe you can see how to can in extra virgin olive oil. 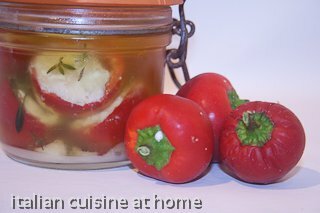 The doses of cheese depend on how great are the hot peppers and regarding the olive oil on how great is the pot for canning. Obviously you can eat them without canning, but the flavors will not blended as after canning.